ACI-NA’s Airports@Work Conference brings together the most complex facets of airport operations — safety, security, environment, technology, and technical affairs for a collaborative discussion about today’s challenges and tomorrow’s opportunities. Environment – Join fellow airport environmental staff, experienced consultants and experts to learn about the latest developments on a variety of airport environmental topics ranging from stormwater to noise and many in between, including regulatory updates. The information exchange begins with the eight environmental working groups meeting in break-out sessions, followed by a variety of panel sessions. Security – The track offers the chance for airport safety and security professionals to meet with officials from TSA, FAA and other agencies and discuss current challenges facing North America’s airports. Technology – Technology evolves by the minute, but is your airport able to keep up with the latest trends? Get up to speed on the ever-changing IT landscape and how to capitalize on the value of your airport’s IT infrastructure. Operations – This is a “can’t miss” track for airport operations, safety, planning, and engineering professionals. The conference will feature interactive working group breakout sessions, a host of in-depth panel discussions, and regulatory updates from both sides of the US/Canada border. Please click the icons below to view and download the track agendas for ACI-NA’s 2019 Airports@Work Conference. Live Question & Answer – use the app to ask questions throughout Wednesday’s sessions and speakers will answer them during the Q&A portion of the session. 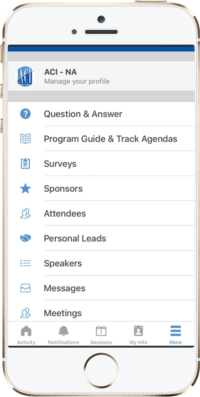 Personal Leads – connect with other attendees by scanning an in-app QR code to share your information and collect theirs without searching for your business cards. Earn points within the app for a chance to win a $150 Visa gift card. Points can be earned throughout the conference by completing session surveys, posting a status update, commenting on another attendee’s status update, checking into sessions, posting photos and more. Your login information will be the email address you used when registering for the conference and the password “airports” (we recommend entering this password over using the apps “Automatic Login” feature). If you have any questions or need help with the app, please email app@airportscouncil.org or visit our mobile app help desk on-site during breaks near registration. Looking to see more of what Salt Lake City has to offer while you’re in town? Check out the many attractions, destinations, restaurants, things to do and places to see listed on Visit Salt Lake’s website . Getting around is easy in Salt Lake City’s walkable downtown or by using its TRAX light rail system and other transportation options. View a full overview of the sessions available at this year’s Airports@Work Conference by downloading our at-a-glance agenda. Individual session track agendas are available for download on the Agenda tab. April 7, 9:00 a.m. – 5:00 p.m.
April 2, 7:30 a.m. – 4:00 p.m.
April 3, 8:00 a.m. – 4:00 p.m. In order to reduce our carbon footprint and ensure our conferences are environmentally-friendly and sustainable, we will have a limited number of printed at-a-glance agendas available on-site on a first come, first served basis. We encourage attendees to download our mobile conference app to view session information, including times, locations, speaker information and more.